The biggest of all European tortoises, a fully-grown marginated tortoise can reach a length of about 14 inches and weigh up to eleven pounds. Unlike many other tortoises, its shell has an oblong shape that is extremely thick around the middle of the body. The back part of the shell fishtails up and out above the legs in a way that resembles the bottom lip on a bell. Most adults have a carapace that is almost entirely black, with minimal yellow highlights near the center of each plate. It's easy to tell from other tortoises because of the back part of the shell, which doesn't divide over the tail. This can give the tortoise's rear half an odd, almost fish-like appearance reminiscent of a sunfish. But, unlike fish, these guys can't swim. These tortoises are one of the most commonly chosen for pets because of their quirky appearance and overall friendliness. Marginated tortoises are known to love basking in the sun almost as much as a flower! They are active in the daytime and rarely hide away during daylight hours. These tortoises are more than happy to spend a sunny afternoon exploring their enclosure or the back garden-- though, since they are herbivorous, it may be wise to keep them out of your cabbage! Wild marginated tortoises are found in the southern part of Greece, ranging all the way from Mount Olympus to the Peloponnese peninsula. They can also be found in smaller populations located in Italy, the Balkans, and even the northern part of Sardinia. This breed of tortoise prefers mountainous areas, and has been found living in the mountains up to 5,200 feet! In this cold environment, their mostly black carapace comes in handy, because it makes it easier for them to absorb a lot of heat during the daytime, helping keep a healthy body temperature. They tend to spend their morning hours absorbing sunlight while they look for food, then go back to the shade to rest and digest. Being herbivores, marginated tortoises eat mostly vegetation. Their favorite foods include plants like clover, dandelion, watercress, kale, honeysuckle, coriander, parsley, spring greens, carrot, parsnip, and even bell peppers! Most of a healthy marginated tortoise's diet consists of leafy greens, as this reflects what they would eat in the wild. However, some of the packaged tortoise foods on the market make delicious alternatives during times when fresh produce is not readily available. Unlike some other breeds of tortoise, the marginated tortoise never requires a water dish. They are extremely efficient in the way their bodies use and store water, so they rarely (if ever) need to drink it. The vast majority of the fluid they need to survive can be found in the food they eat. After mating, female marginated tortoises dig a hole where they can lay their eggs. If she is particularly large and healthy, she may lay fifteen eggs at a time, up to three times in one summer! Each egg incubates for about 100 days before hatching, but if the eggs are stored in an incubator, they may begin to hatch as early as sixty days into incubation. 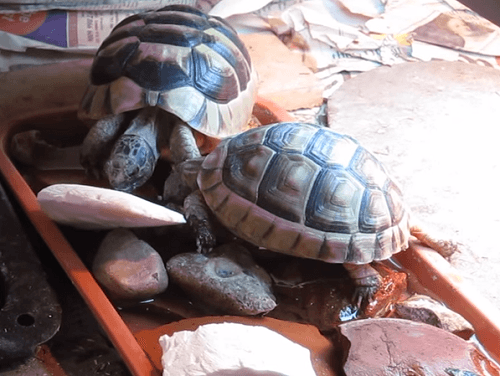 Most pet owners keep marginated tortoises in a wooden vivarium, which allows them to live in temperatures high enough to sustain health and prevent them from hibernation. The vivarium should be kept hot at one end, but cooler at the other end, allowing for maximum temperature regulation. The basking bulb in their vivarium should be on for roughly twelve hours per day. At night, they should be shut off to allow the tortoise to cool off and go to sleep. They also require UVB lighting, which will allow them to create Vitamin D inside their skin, just like us.